This website is the property of Van Remoortel. When you access and use the website, you expressly accept and agree to the following general terms and conditions. The content of the website, including trademarks, logos, drawings, data, product or company names, texts, images, etc. is protected by intellectual property rights belonging to Van Remoortel or entitled third parties. The information contained on the website is general in nature. It is not adapted to personal or specific circumstances and as such cannot be considered as personal, professional or legal advice to the user. Van Remoortel makes every effort to ensure that the information provided is complete, true, accurate and up to date. However, despite these efforts, inaccuracies may occur in the information provided. If the information provided contains inaccuracies or if specific information on or linked to the website is unavailable, Van Remoortel shall make all possible efforts to rectify this as soon as possible. Nonetheless, Van Remoortel cannot be held liable for any direct or indirect damage resulting from the use of the information on the website. If the user finds any inaccuracies in the information provided on the website, he/she should contact the website administrator. The content of the website (including links) may at any time, without announcement or prior notification, be adjusted, changed or completed. Van Remoortel does not guarantee the proper functioning of the website and can in no way be held liable for any malfunction or temporary unavailability of the website, or for any direct or indirect damage resulting from access to or use of the website. Van Remoortel can under no circumstances be held liable, directly or indirectly, specifically or otherwise, vis-à-vis anyone for any damage attributable to the use of the website or any other website, in particular as a result of using links or hyperlinks, including, but not limited to, any loss, work disruption, damage to the user’s programs or other data systems on computers, to hardware, software or other equipment of the user. The website may contain hyperlinks or indirect references to websites or pages of third parties. Any such links to such websites or pages shall not imply in any way the approval of the content thereof. Van Remoortel expressly declares that it has no control over the content or over other features of these websites and can in no way be held liable for their content or features, or for any other form of damage resulting from their use. The website is governed by Belgian law. Only the courts of the district of Ghent are competent to settle any disputes. Van Remoortel believes that your privacy is important. While most of the information contained on the website is available without having to ask the user to provide personal information, the user may, at some point, be asked to submit personal details. This information will be used for the sole purpose of providing a better service (e.g. for our customer database, to keep users informed of our activities, etc.). The user may, free of charge and on request, always prevent his/her personal details from being used for direct marketing purposes. To do so, the user should contact Van Remoortel by email: info@vanremoortel.be. Your personal details will never be disclosed to third parties (should this prove necessary, you will be informed accordingly). In accordance with the Act on the processing of personal data of 8 December 1992, the user has the right to access and correct his/her personal details. 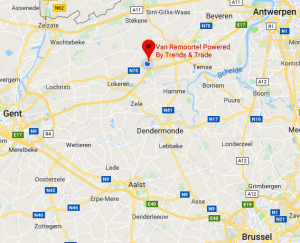 Subject to proof of identity (copy of the user’s identity card) the user can send a written, dated and signed request to Van Remoortel, Schrijberg 189-193, 9111 Belsele, Belgium, or send an email to info@vanremoortel.be, in order to receive an overview of his/her personal details as kept by Van Remoortel. If necessary, the user may also ask to correct or delete any incorrect, incomplete or irrelevant data. Van Remoortel may collect non-personal anonymous or aggregate data such as browser type, IP address or operating system used, or the domain name of the website that refers the user to and from our website, in order to ensure the proper functioning of our website for all users. Cookies may be placed on the hard drive of your computer when you visit this website. The sole purpose of these cookies is to ensure that our site is geared to the needs of users returning to our website. These mini files, or cookies, are not used to check the behaviour of the visitor on other websites. Your internet browser allows you to reject cookies, be alerted when a cookie is installed and remove cookies from your hard drive. Please consult the help section of your internet browser.